A variable effort spring support is a resilient device which absorbs/accommodates the vertical displacement of a piping system. The variable support is recommended for relatively small displacement (up to about 75mm). Variable effort spring supports function on the principle of Hooke’s Law, which states that the force required to compress a spring is directly proportional to the compression of the spring. Therefore, the compression (i.e. the supporting effort) of the spring within the variable effort support changes in proportion to the forces exerted on it by the pipework as it rises/falls due to thermal expansion/contraction. This enables the spring support to safely accommodate and balance the vertical displacement thus avoiding excessive pipework stresses. Both the AV and LV spring supports are produced in four basic travel ranges; 35mm, 70mm, 140mm and 210mm. These are designated AV35, LV35, AV70, LV70, AV140, LV140, AV210, LV210. These travel ranges indicate the maximum working range of the springs. This full travel can be used provided that the necessary calculations are carried out to ensure that the connecting equipment and pipework can withstand the load changes that occur during pipe movement. Most national standards do limit the load variation to a maximum of 25%. It is therefore usual to select variable spring supports on this basis. Precompression of the spring coil into the casing saves headroom and erection time. For each series there is a reserve travel at the upper and lower limits of the unit. All steel construction that is rugged and compact. Grade 316 stainless steel is used for scale plate and name plate. Spring Pressure plate serves as a centering device. Finish – hot dip galvanized – specialized coatings are also available. All ‘F’ type floor/base mounted units are inclusive of load flange and internal load column guide. 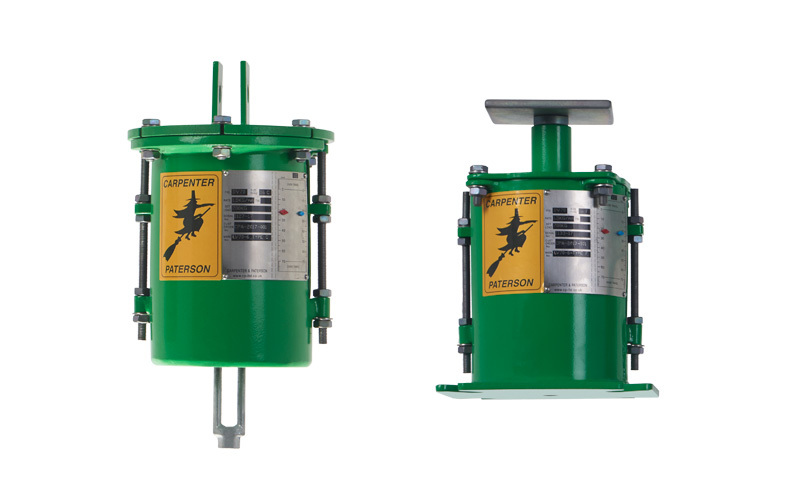 Travel stops – The Carpenter & Paterson design is supplied with stops to take the preset and hydrostatic test loads. Limit stops permanently installed to prevent the movement of the pipe beyond predetermined distance or load within the travel range of the spring. 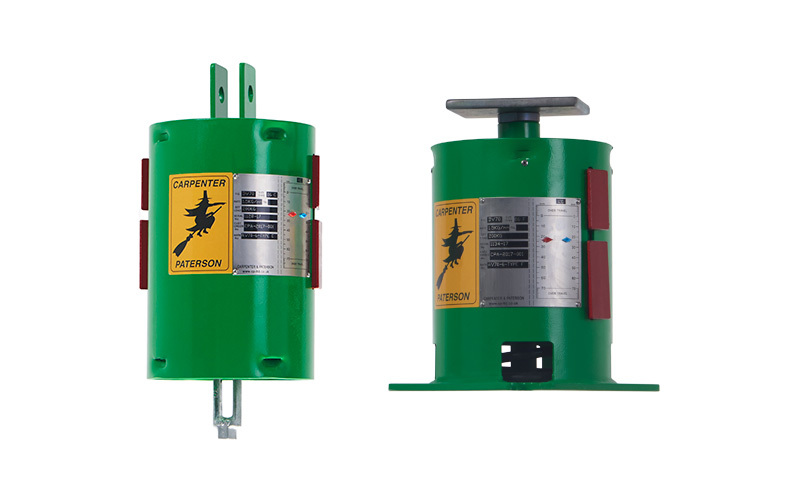 Lifting lugs are available on large sizes to facilitate erection and installation. For extreme environmental conditions we are able to manufacture our units in a range of austenitic stainless steels.